Zeus God Of Thunder slot machine is the latest brilliant game in the legendary Zeus series from WMS, and is maybe the best yet. This new mobile slot has 5 reels, 30 paylines and an incredible 5 different progressive jackpots available making the win potential massive. There are also 4 bonus features in the game including the Wild Spins feature where you can win up to 100 free spins, the Extra Bet feature, and the Wheel Feature. 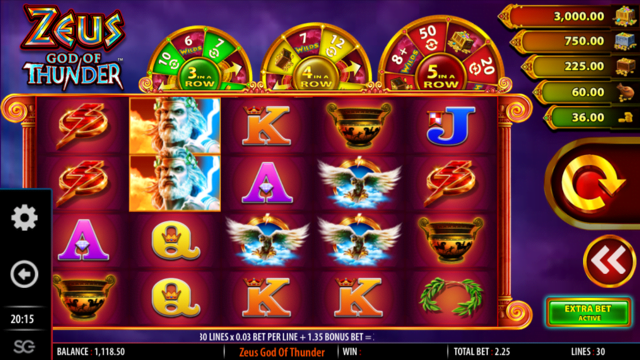 Keep reading below for all the details in the full Zeus God Of Thunder slot review. While there are countless video slot titles out there that draw upon themes from Ancient Greek mythology to engage their players, perhaps none of them are quite as exciting as WMS’ latest effort dubbed the Zeus God Of Thunder slot. This five-reel, 30-payline slot serves up a rather unusual gameboard given that there are green, yellow and red prize wheels situated above the main base game reels. A special table for jackpot pays also features on the right-hand side of the screen, while the unique symbols to feature include eagles, lions, vases, wreathes, lightning bolts and the mighty Zeus himself. Playable from as little as £0.50 per spin across all desktop, mobile and tablet devices, the Zeus God Of Thunder slot machine offers players access to five progressive jackpot prize pools, meaning there’s always the potential for huge wins on any given spin. In addition, the aforementioned prize wheels offer plenty of extra incentives to players, with a mind-blowing 100 free spins available if you’re particularly lucky. Given the gameboard in the Zeus God Of Thunder slot has a rather unusual appearance, it should come as no major surprise that the way in which players trigger the bonus feature is a little different as well. As they spin, players will notice that certain symbols on the reels appear with a dark and stormy cloud background – and they will need to line-up a number of these on consecutive reels in order to profit. When playing on the game’s default setting, players will only have access to the first prize reel for landing three cloud-backed symbols in a row. Should they enable the slot’s “extra bet” feature, however, they’ll also be able to progress onto the second and third prize reels for landing four or five cloud-backed symbols respectively – and this is important because the latter is home to the big prizes. On the final prize reel, players will be able to collect the three largest progressive jackpot prizes, the maximum award of 100 free spins and or a mega spin featuring up to seven substitute wild symbols. As you can probably tell, the Zeus God Of Thunder slot is a pretty dramatic take on the classic Greek slot and provides plenty of excitement throughout – especially when played with “extra bet” mode enabled. Like the Zeus God Of Thunder slot review? Check out these as well…..